Blade length : 69.3cm or 27.2 inches. Width at the hamachi : 2.7cm or 1.06 inches. Kasane : 0.685cm or 0.269 inches. Era : Late Kamakura to Ealy Nanbokucyo period.1334. with regular width and thickness with suitable sori and longer kissaki. Bo-hi is engraved on both sides of the blade. Jigane :Koitame hada well grained with jinie attach very clear nice texture. 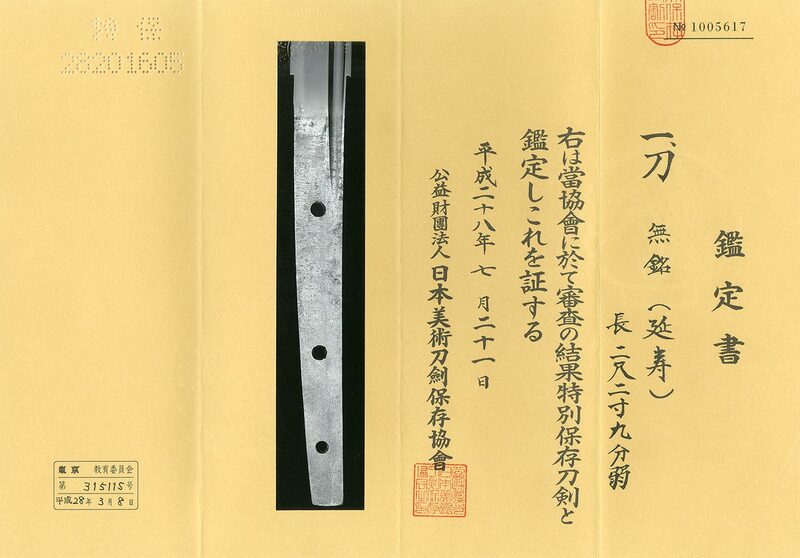 On the surface of the blade, utsuri appear. Hamon :Nie deki suguha and many ashi scatter. and came to an end in the Age of Provincial Wars. The representative swordsmits were Kunimura, Kuniyoshi, Kuniyasu and Kuninobu. The workmanship of this katana is close to Rai School. Saya :brown red color saya. Menuki : a man is engraved by syakudo plate. 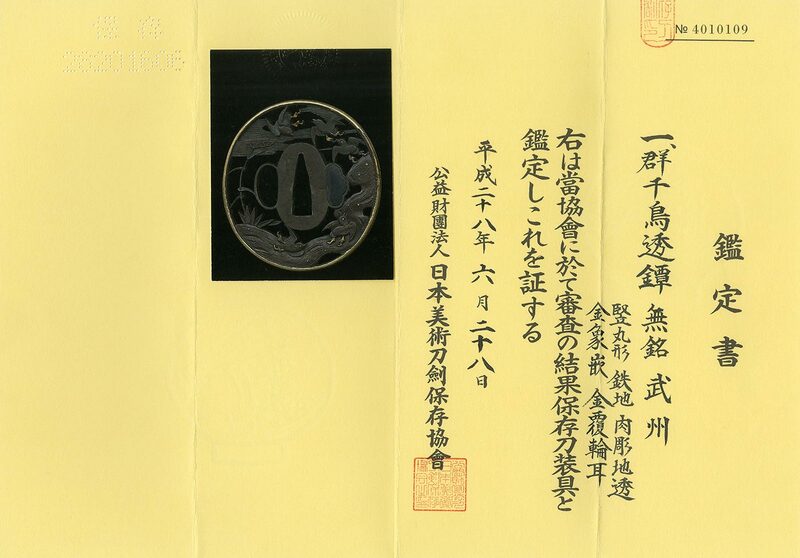 Fuchikashira:On the syakudo nanako plate, some plant and flying birds are engraved with gold color. From Aoi Art:Enjyu school is a stream of the Rai school. out. This school influenced Hizen swords especially excellent jigane and hamon. The mounting is good condition and well fit for the sword. NBTHK Tokubetsu Hozon Paper for the blade. NBTHK Hozon Paper for the Tsuba.